When I grow up, I want to be like Heather Graham! She has grace. She has charm. She has compassion. She has over 150 published books and is on the New York Times best seller list. She also has her feet firmly on the ground. I was recently able to spend time with Heather and Connie Perry on a public event level and a small social gathering level. Both ladies are top notch in my book! Heather was the Keynote Speaker at my writing group's annual readers' luncheon. It was an awesome event! Heather is hosting an event on December 14, 15 and 16 - Writers for New Orleans. All of her proceeds go back to New Orleans. She is looking for basket donations and other goodies. For more information, visit www.writersforneworleans.com. 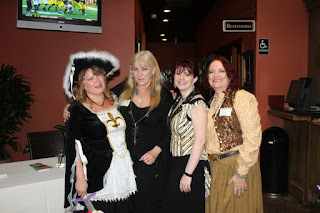 I will leave you with a picture of Heather and The Rowdy Girls (Me the vampirate, Heather, Meredith Pence Tague and Nancy Brandt).